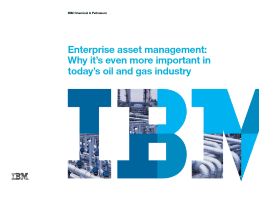 Download this ebook as it examines the role of enterprise asset management (EAM) tools in the era of the Internet of Things, and explores how you can use these capabilities to take full advantage of data, boost operational efficiencies and make better decisions faster. With global organizations and systems that are more instrumented, interconnected and intelligent than ever, the oil and gas industry has the potential to optimize operations and increase efficiency by using data in new ways. The core functionalities of enterprise asset management systems — flexibility, scalability and integration — support these goals.